Do you want to surprise your loved ones with special treats this Valentine’s Day? If you do, then you might want to try these three new indulgent confections from Max’s Corner Bakery’s: rich Red Velvet Cupcake, heart-shaped Chocolate Truffle Cake and the sweet, luscious and colorful French macaroons. You don’t need to worry about the price of these newest sweet offerings from Max’s Corner Bakery because they’re really quite affordable. 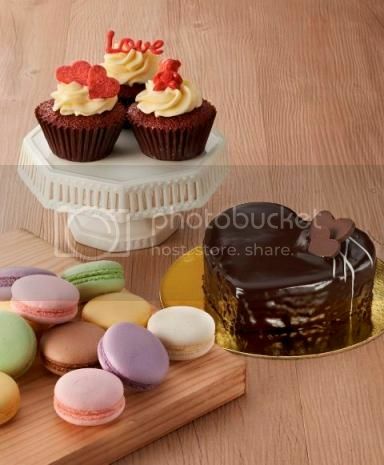 Your family and friends can enjoy the delightful sweetness of the Red Velvet Cupcake topped with cream cheese frosting for only Php50, experience the rich decadence of the heart-shaped Chocolate Truffle Cake for only Php199, and savor the bite-sized goodness of deliciously light French Macaroons (3 pieces per pack) for only Php88. These yummy, sweet treats will be available in all Max’s restaurants from February 1 to 28. Now here’s more good news! Customers celebrating the season of hearts at Max’s with a minimum purchase of Php1,500 will receive a free pack of Max’s Corner Bakery’s French Macaroons from February 11 to 17. So what are you waiting for? Head over to the nearest Max’s Restaurant now with your family and friends and make your meals extra special by sharing these newest sweet treats from Max’s Corner Bakery. This entry was posted in Max's Corner Bakery, Valentine's Day. Bookmark the permalink. would love to try their new treats! sana i won’t forget…! !